Beast Zine - ZineWiki - the history and culture of zines, independent media and the small press. 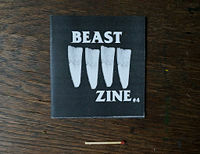 Beast Zine is a fanzine by Jeans Beast. The pretty experimental zines vary in stile, size and content. The zine is produced and published in Mönchengladbach, Germany. Jeans Beast is also associated with the music label Econore (Econore Magazine), specialised in noise and experimental music. Issue #4 and #10 of Beast Zine is included in the collection of the St. Patrick's Zine Library. See also the related article: Econore Magazine and Econore Journal. This page was last modified on 30 December 2013, at 15:46.